It was announced in December that Honeysuckle was Pantone's official color of 2011. Since then, I have slowly seen more and more Honeysuckle showing up in fashion and home decor, especially now that the weather is warming up. Indeed! Honeysuckle is the perfect vibrant color for summer style. I had so much fun pulling together this group of Honeysuckle hued items for home and fashion that I am Head Over Heels for it this summer. Fun, bright, upbeat and stylish right? It screams summertime! I am dying to get my hands on that cute dress from the Gap ASAP! Perfect for summer parties. I also need to get that croquet and bocce ball set from Target, the price is a steal and we love yard games in the summer! Ideally I'd like to buy everything I just featured, but I think my hubby might have a problem with that amount of spending (he-he). Which items were you HOH's for? Are you starting to see this color everywhere too? I'll have an update on our tornado home repair and recovery tomorrow! There is a least one bit of good news so far! Have a fun weekend everyone! Be sure to stop by next Friday to see what I am Head Over Heels for next! Pantone is the the world-renowned authority on color. Pantone's founder created an innovative system for identifying, matching and communicating colors to solve the problems associated with producing accurate color matches in graphic arts. This led to the innovation of the Pantone Matching System, a book of standardized color in fan format. Simply put, using the Pantone system means the Honeysuckle color you use -on say a pillow- will match back to anything else (made by someone else) with that Honeysuckle Pantone formula... Perhaps it's not entirely simply put after all? It is how companies allow for color consistency between products. There you go! 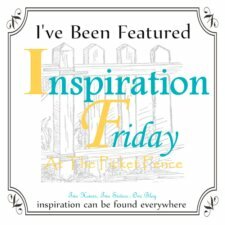 I've linked up At the Picket Fence! Join the party!